Be Where The Party Is! This is the Ultimate Bounce House. 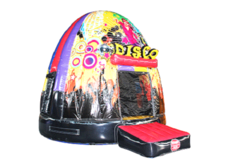 The Disco Dome Party Bounce House is a one of a kind inflatable and is equipped with state of the art sound and a complete light show. We bring the club to you! Intergrated with bluetooth technology The Disco Dome will connect to your device and the party begins!